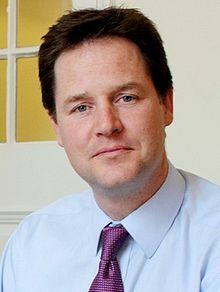 Below is the text of the speech made by the Leader of the Liberal Democrats, Nick Clegg, to the party conference on the 23rd September 2009. In the last eight weeks, 28 British soldiers and Royal Marines have been killed in Afghanistan. However easy it may be to forget, we are a nation at war. Already more than 75,000 British men and women have done tours of duty in Afghanistan. Thousands upon thousands of our compatriots, putting their lives on the line in the burning heat and the frozen winters of a country on the other side of the world. I want to pay tribute, on behalf of all of us, to the tenacity, bravery and extraordinary professionalism of every one of them. Their families, too, have borne with incredible fortitude the separation, the fear, and the anguish of bereavement. We salute them. I’m afraid the hardship has been deepened, for all of them, by the enormous difficulties of this war. After nearly 8 years, victory not only seems more distant than ever, failure seems inevitable unless we change course. I know some of you believe we should call for British troops to withdraw now. If things continue on the present disastrous course, then sooner or later that is a judgement which we may need to make. That is why we must change course. We have one more chance, one only, to turn things around. Success cannot be secured through military means alone. Development assistance must be bigger and faster. Talks with moderate elements of the Taliban network must commence. The international community must at last agree to a single plan in place of the present patchwork of duplication, disunity and muddle. The threadbare legitimacy of the government in Kabul must be strengthened by reaching out across ethnic and tribal divisions. And here at home Gordon Brown must change gear, too. He must now show the leadership and conviction that has so far been so disastrously lacking in making the case to the British people. You cannot win a war on half horse power. We owe it to the young men and women serving in Helmand to give them all the political leadership and all the resources they need to do the job. We should either do this properly or we shouldn’t do it at all. So I say to the Prime Minister: time is running out. Unless you change course, there will be no choice but to withdraw, and that would be a betrayal of the servicemen and women who have already made such enormous sacrifices on our behalf. I do not want British troops to come home defeated by political failure. I want them to come home, mission successfully completed, with their heads held high. Let me tell you why I want to be Prime Minister. It’s because I want to change our country for good. Because I want to live in a country where prejudice, insularity and fear are conquered by the great British traditions of tolerance, pluralism and justice. Where political life is not a Westminster village freak show, but open, accessible and helpful in people’s everyday lives. Where fine words on the environment are translated into real action. Where every child can grow up safe and secure, able to flourish, no matter their background, their income, or the colour of their skin. Where we make sense of the complex, globalised world of our times and play a creative role in shaping it. Where rights, freedom and privacy are not the playthings of the government but safeguarded for everyone. I want to be Prime Minister because I want to be the first Prime Minister in my lifetime to be on the side of the weak against the powerful, on the side of freedom against conformity, on the side of human innovation against government decree. I want to be Prime Minister because I have spent half a lifetime imagining a better society. And I want to spend the next half making it happen. I was lucky enough to be brought up in a large, warm family that had almost no time at all for the status quo. By parents who encouraged us, required us, as children always to ask why. Always to assume that there is a better way of doing things. If you only bother to look for it. That’s the spirit I found in the Liberal Democrats. It’s why I joined, and why I wanted to lead our party. Friends, this has been quite a week for us. I’ve been called a number of names. Even “a good leader”. By Evan Harris. I am never going to duck asking the important questions, however difficult they are. But I am immensely proud to lead a party that actually debates things, openly and democratically. Let’s always remember: we are in this together. So let us not look back any longer. Let us look forward. From this point on, keep your eyes on our goal. Let today mark the beginning of real change in Britain. These are extraordinary times. A global recession. Mass unemployment. A broken political system. Government finances in crisis. And still: inequality rising and climate change spinning out of control. Faced with these extraordinary challenges; We need an extraordinary government. Because one thing, above all others, is certain. The way we got here is not the way out. The blue-red, red-blue politics that got us into this mess cannot clear it up. The way we got here is not the way out. Britain needs a change of direction. Let today mark the beginning of real change in Britain. Look at what the old red-blue politics offers. Back in 1997, Peter Mandelson told us to judge Labour after 10 years in government. It’s been twelve years. And we have made our judgement. If you’re poor, you’re still far less likely to go to university than if you’re better off. If you’re from an ethnic minority, you’re more likely to be stopped by the police, even when you haven’t done anything wrong. If you’re a woman, you’ll probably be paid less than the men you know. And if you’re a child born in the poorest neighbourhood of my city, Sheffield, you will probably die 14 years before a child born the same day, just up the road, in a more affluent part of town. We have made our judgement of Labour. They betrayed the best hopes of a generation. People are hungry for change. So the question now is: what change? David Cameron talks about change. But is it real change? He talks about broken Britain but campaigns for tax breaks for the very rich. He says he cares about the environment but then teams up with climate change deniers in Europe. He claims he wants to clean up politics but won’t tell you whether his biggest donor pays taxes in Britain. That isn’t real change, it’s fake change. And Britain deserves better. To be fair, the Conservatives do have one belief. That it’s their turn to govern. They think power should come easily. You get the sense from so many of them that they became Conservatives mostly because it looked like the simplest route to a job in the cabinet. I chose the Liberal Democrats. Not because I thought it would be an easy route to power. I knew it would be hard. But because I wanted to fight for what I believed in, however hard, however long it took. The Conservatives want to inherit power; I want us to earn it. The thing about David Cameron is – the PR might be good, but what’s behind it? It’s like my grandmother would have said. There’s less to him than meets the eye. As for me? Well, occasionally I’m a bit too blunt in interviews – but at least you know I’m not just spinning you a line. I speak out. On the Speaker of the House of Commons. On citizenship rights for the Gurkhas. And I am so honoured that some of you have been able to be here with us today. People are turning to the Liberal Democrats. Because they see there’s something different about us. It’s our pioneering spirit. It was a liberal, Gladstone, who helped develop the concept of universal human rights. It was a liberal, Lloyd George, who introduced the world’s first universal state pension. It was a liberal, Beveridge, who invented the NHS. Ours is the party of Paddy Ashdown, the first person to put climate change on the national agenda. Ours is the party of Charles Kennedy. Of Ming Campbell. Who used all the courage of their convictions to oppose the illegal invasion of Iraq. Ours is the party of Vince Cable, the first to see problems brewing in our economy, the first with a vision of how to take us to recovery. It’s because Liberal Democrats are different that, when Gordon Brown let casino investment banking loose on our economy. The Conservatives said yes, and only Liberal Democrats said no. When Gordon Brown let house prices rocket and personal borrowing get out of control, the Conservatives said yes, and only Liberal Democrats said no. When the contracts were being drawn up for new polluting runways. When our civil liberties were being torn up. When our troops were massing on the borders of Iraq. The Conservatives cheered from the sidelines, and only Liberal Democrats said no. We are the only party that offers real change at the next election. Labour is dying on its feet. We are replacing them as the dominant force of progressive politics. We are the alternative to a hollow Conservative party that offers just an illusion of change. Make no mistake. There is only one party that will bring real change to Britain. The Liberal Democrats. The biggest challenge for the next government will be sorting out the public finances. It’s a challenge neither exhausted Labour nor fake Conservatives are fit to take on. This year’s deficit is likely to be one of the highest in Europe. We will borrow £175bn this year alone – £5,550 every single second. Total national debt could hit £1.2 trillion next year – £20,000 for every man, woman and child. I’ll be straight with you. There is no easy solution. There isn’t a serious economist in the world who agrees with the Conservatives that, right in the grip of recession, with two and a half million unemployed, we should pull the rug out from under the economy with immediate spending cuts. But, once the economy recovers, we are going to have to control spending tightly for many years to come. We were right, in years gone by, to campaign for new spending to help people, to support them, as children, as young adults, as parents and as pensioners. As Charles Kennedy rightly says: our commitments demonstrate generosity of spirit. And those manifestos were right for an age of plenty. Now something different is needed. But let me make something very clear. I am not going to abandon our vision for a better Britain because money’s tight. It makes me more determined. Balancing the government books isn’t a maths test. Fiscal discipline is not an end in itself. We offer discipline for a purpose. Not just austerity, but progressive austerity. Reducing the deficit, yes, but also building a fair society and a green economy. Still driven by generosity of spirit, but fit for the circumstances of the day. It’s the only way to deliver real change in Britain. That’s why our approach is completely different from the two other parties’. We aren’t going to salami-slice budgets like Labour and the Conservatives. Pretending that you can save billions of pounds just by using fewer paperclips and putting up the price of Parliamentary salads. It isn’t true, and everyone knows it isn’t true. We know what happens when you simply squeeze budgets, across the board, until the pips squeak. We know, because we lived through it before, under the Conservatives. We remember the tumble-down classrooms, the pensioners dying on hospital trolleys, the council houses falling into total disrepair. We remember, and we say: never again. Liberal Democrats will do things differently. Not shaving a bit off everything, but asking fundamental questions about what the government should and shouldn’t be doing. Working out, openly and publicly, what works and what doesn’t. So we can completely cancel the things that don’t work. In order to protect, and even in some cases extend, investment that really matters. That is progressive austerity. We’ve already identified big areas where substantial long-term savings can be made. Reducing the bureaucracy of Labour’s centralised state, databases and agencies. Cutting the cost of politics – changing our electoral system and having 150 fewer MPs. Reforming tax credits so they go to the people who really need them. Spending less on defence procurement. We heard yesterday Gordon Brown is considering taking one of the Trident nuclear submarines out of service. I welcome that step in the right direction. But if you want to lead nuclear disarmament around the world, you need to be more decisive. That is why we say no to the like-for-like replacement of Trident. Some people have asked me why we’ve talked so much about identifying cuts. I know it doesn’t feel comfortable some of the time. But we’re doing it because we know that the more we save, the safer our schools and hospitals will be. And we know that if we save enough, we will still be able to include in our manifesto, despite these difficult times, some of the pledges for new investment that we hold so dear. Because if we end the child trust fund, we can pay for smaller classes for five, six and seven year olds. If we stop the waste of money on the useless NHS IT system. We could improve maternity services so every new family gets a great start. If we substantially reform politics, with fewer MPs, government ministers, departments and quangos, we could save billions. And we could put the money into insulating homes and improving public transport, creating thousands of new, green jobs. Building up Britain’s infrastructure not our bureaucracy. Many of these decisions will be difficult. Taking them is the price of fairness. But if we are brave enough to take them. It will be the beginning of real change in Britain. I want to say something to teachers, doctors, nurses, police officers, social workers, in fact to everyone who works in our public services. Britain depends on people like you and the services you provide. I know these are anxious times for you. Everyone is talking about cuts. But neither Labour nor the Conservatives has come clean about what that means for you. They’re not treating you like grown-ups. I want to work with you, hand in glove, to agree the way forward on pensions and on pay. On pensions. Of course, we will guarantee every penny of entitlements you’ve already built up. But we do need to have a proper, independent review of what’s fair, not just for public sector workers, but also for the taxpayers who pay your salaries. Let me reassure you: my particular focus will always be on the gold-plated pensions enjoyed by senior civil servants, quangocrats, judges – and MPs. At a time of pressure for everyone, it’s only right for those with the broadest shoulders to take the greatest weight. Next: pay. We will never go back on an existing pay deal. That would be a betrayal. But in future, we need to work together to agree strict, disciplined limits. Again, I believe people with the most generous salaries should take the brunt of cuts so their lower-paid colleagues don’t have to. But if it comes down to discipline on pay or mass redundancies. I think we all agree: protecting jobs must come first. Young people are bearing too much of the burden of this recession. Imagine how it must feel to have slogged your way through school, college or university, maybe racking up thousands of pounds in debt, only to find there isn’t a job, any job, at the other end. This is supposed to be one of the most hopeful, optimistic moments in your life. Imagine sitting at home day after day, no money, nothing to do but wait for your fortnightly appointment at the JobCentre. We used to worry about getting our children onto the property ladder. Now we have to worry whether they’ll ever get a job. There can be nothing more dispiriting at this formative moment. It destroys your self-confidence, perhaps for good. I want to say, to young people. I am sorry. I am sorry that you have been, already, let down so many times. I am sorry that you will spend your working lives burdened by the debts of a previous generation. But sorry isn’t good enough. Our job isn’t to feel bad about problems, it’s to fix them. My commitment to the next generation is simple. The Liberal Democrats will not fail you. So today we make a new promise to young people that they will not be unemployed for longer than 90 days before we find them work or training. Let me spell out what that would mean: If you lost your job today, we’d find you work, training, or a paid internship by Christmas. Right now, we would cancel Labour’s VAT cut and use the money to invest in young people’s futures. We would pay for 10,000 more university places and 50,000 more college places this year. And we would introduce a new “Paid Internship” scheme to give people real job experience. With an allowance of £55 a week. Young people would get experience that could make all the difference when it comes to looking for a job. And you know. We could pay for 800,000 placements. for 800,000 young people. For the cost of just one weekend’s VAT cut. If it’s between 15p off a cinema ticket and a decent future. I know what we should choose. I have always believed that you can’t make progress as a society unless every generation tries to do better for its children. That’s an idea that’s at the core of Liberal Democrat values. Providing opportunity for our children, even as we provide dignity and security in retirement and old age. To build a fair society, you have to start with children. And you have to start young. In Britain today, a poor, bright child will be overtaken by a less intelligent, but wealthier child by the time he is seven. This has to change. The first few years are the most important in determining a child’s future. Those first few years when their character, their personality are being shaped. The first few years are the most important ones. That’s why we’ve always said: scrap the Child Trust Fund, which gives people a cash handout on their 18th birthday. And invest the money when it can really make a difference. With classes of just 15 for five, six and seven year olds. The beginning of real change in Britain. If you want to know how fair a society is. Look at its tax system. Britain’s is painfully unfair. The poorest pay a bigger slice of their income than the richest. Polluters are allowed to get away with harming our environment without paying for the clean-up. And we lose as much as £40 billion a year to tax dodgers. That’s why the Liberal Democrats are going to reinvent the tax system to make it fair. Not changing the amount we raise, but changing who pays. We will raise the income tax threshold to £10,000, funded by closing loopholes that the wealthy exploit. And by making sure polluters pay for the damage they cause. I’ll be honest. If you’ve got a house worth over a million pounds. If you fly trans-Atlantic a couple of times a month. If you get a seven-figure bonus paid in share options to get round income tax. You will pay more. That is what is fair. Why on earth should you get tax subsidies paid for by people whose salaries are just a tiny fraction of yours? I don’t want to penalise people who work hard. If you can make it big: all credit to you. But what it should win you is respect, not exemption from your tax bill. In exactly the same way as on public spending. Many of these decisions on tax will be difficult. Taking them is the price of fairness. If we are brave enough to take them. It will be the beginning of real change in Britain. So if there’s one policy you take away from this conference. One policy to mention on every doorstep, in every phone call, in every leaflet. Let it be this one. We will deliver fair taxes Under a Liberal Democrat government, people will not pay a single penny of tax on the first £10,000 they earn. Millions of people will find themselves with an extra £700 in their pocket, and up to four million low earners and pensioners will pay no income tax at all. The beginning of real change in Britain. After the expenses scandal, people are crying out, rightly, for something different at Westminster. Labour and the Conservatives have betrayed them. They offered warm rhetoric about change when the scandal was at its height. And then did nothing. They will defend the status quo to the last breath. Only the Liberal Democrats will clean up Westminster, reform expenses, end big donations and elect the Lords. Only the Liberal Democrats will give people the right to sack MPs who are found guilty of serious wrongdoing. And only the Liberal Democrats will secure, once and for all, fair votes for everyone. That means radical electoral reform, argued for from first principles. Not just some minor tinkering, put forward by a dying Labour government as a last, desperate attempt to save its skin. We must do away with safe seats. Did you know, nearly half of Britain’s constituencies have elected the same party in every election since I was born? These are seats where you could put a red or blue rosette on the back end of a donkey and it would still win. Only when every MP has to do a decent job and win the trust of the people they represent will we ever clean up politics for good. It will be the beginning of real change in Britain. Imagine a Liberal Democrat cabinet. Maybe the odd heated meeting. But imagine Liberal Democrats at work. Dr Vince Cable, of course, in his office at the Treasury. Ushering in fairer taxes. Cutting the banks down to size. Tearing up the Treasury red tape that strangles local government. And that’s all between breakfast and lunch before he rattles off another book for the day. I tell you, when it comes to bankers’ bonuses, I can’t think of anyone better to send into the negotiating room. You think Vince would listen to those reckless bankers demanding their millions? He’d say what we all believe: There will be no bonuses for failure, not today, not tomorrow, not ever again. Then there’d be David Laws at the schools department, hunting down all those boxes and boxes of bureaucratic rules and paperwork that get in teachers’ way, and throwing them out. I mean, recycling them. And if the civil servants say the pupil premium is too complicated. They can’t work out how to invest the extra money to the benefit of the most deprived children. You know David will do the maths himself. Chris Huhne at the Home Office. Restoring the civil liberties so shamefully discarded by this Labour Government on his first day with a Freedom Bill. Cancelling ID cards to help fund 10,000 more police on the streets. You know Chris won’t be put off by technocrats saying it can’t be done. He’ll produce volumes of statistics showing he’s right and look sternly over his glasses until they cave in. Norman Lamb reinventing our NHS for modern times, giving communities and patients a real say. Professor Steve Webb getting to work at the crack of dawn to improve pensions for women. Sarah Teather and Norman Baker, building Britain’s infrastructure – the homes we need and the public transport we deserve. Julia Goldsworthy, devolving so much power to local communities she finds she can halve the size of her department. And, Simon Hughes, taking charge of environment and energy policy. This is a man who’s faced death threats to bring a killer to justice. Who’s been involved in every environmental campaign you can think of since the 1980s. He isn’t going to listen to vested interests who say “it’s too difficult”. He’d set our course for the zero carbon future we need. The beginning of real change in Britain. Climate change is the greatest challenge of our age, no doubt about it. But it’s also, very much, a challenge of our age. Like so many of the problems governments have to deal with. From financial regulation to terrorism and internet crime. You can’t stop the weather at the cliffs of Dover. That’s why the big deals, the ones that matter, are struck at international forums – like Copenhagen this December. A summit that must, must agree an international plan of action to keep global warming not just below 2 degrees, but below 1.7 degrees. Because that’s what the best science tells us is now needed to prevent catastrophic climate change. Who do you want representing Britain at a crucial summit like that? Labour? They have let us down internationally. It wasn’t just Iraq. It was their disregard for European colleagues, refusing to attend summits, grandstanding about how superior they were. It was their disregard for international law. Their backroom deals with Saudi Arabia over BAE, with Libya over Lockerbie, with America over torture. Labour has undermined Britain in the world. But what’s the alternative? William Hague? David Cameron and William Hague think the nineteenth century state still makes sense in a twenty-first century world. They simply do not understand that in an age of globalisation power must be exercised by nations together, not squandered by nations going it alone. William Hague gives speeches about the enduring importance of the English speaking world. When everyone knows the new power centres are China, India and Brazil. A Cameron-Hague foreign policy would be the most insular and self defeating in modern times. How much influence would they have in Berlin, in Paris, in Brussels? Not a gram. Or even an ounce. And because they wouldn’t stand tall in Europe, they would count for little in Washington too. But there is a third option. Imagine Liberal Democrats around the negotiating table. Ed Davey, our outstanding shadow foreign secretary. Drawing on the wisdom of Shirley Williams. Paddy Ashdown. Ming Campbell. We would secure Britain a stronger role in the world. By putting us at the heart of the European Union and committing us to abide fully by international law. The beginning of real change for Britain. You know, before I went into politics I managed development aid projects in Central Asia. I led negotiating teams on international trade deals with China and Russia. I worked on new rules to help create the largest single market in the world, here in Europe. I’ve seen how different things could be if Britain would only play its cards right. I know there are people who agree with a lot of what we’ve got to say. But who still don’t vote Liberal Democrat. You don’t think we’re contenders. I urge you to think again. If you don’t agree with our policies. If you don’t want big change in Britain. Then don’t vote for us. But if you like what you hear. If you share our vision for a different kind of future. Then go with your instincts; vote Liberal Democrat. Elections are decided by your cross on the ballot paper. Power is not any party’s to be inherited. Power is yours to give to whoever you choose. So don’t turn away, don’t stay at home, don’t vote Conservative just because you think it’s the only option. This is Britain. We don’t settle for second best because we think it’s inevitable. We don’t compromise on our beliefs because people might not agree with us. We stand up for our values with our heads held high. So when you enter that polling booth, choose the future you really want. Make no mistake: the Liberal Democrats will do things differently in Britain. But if you want real change in Britain, you have to take a stand. If you want what we propose, you have to vote for it. If you want tax cuts for ordinary people, paid for by closing loopholes for the very rich. If you want the right to sack your MP if they’re proved corrupt. If you want children to start out at school in classes of just 15. Then vote for it. If you want our prisons to work, so there’s less crime. If you want a lasting job in a new, green economy. If you want Britain to stand tall again in the world. Then vote for it. This is a vital moment in the history of our country. And you have the power to shape it. Labour is lost. They haven’t the ideas, energy or vision to start again. If you voted for them in the past, you have a choice. You can give away your vote to a fringe party. You can stay at home in despair. Or you can join with the Liberal Democrats and make the difference. If you supported Labour in 1997 because you wanted fairness. You wanted young people to flourish. You wanted political reform. You wanted the environment protected. Or you simply believed in a better future. Turn to the Liberal Democrats. We carry the torch of progress now. The choice at the next election is fake change from the Conservatives. Or real change from the Liberal Democrats. At a time like this. A time of real crisis. Britain cannot afford to be taken in by David Cameron’s illusion of change. Britain needs leadership from a party with real passion, and it’s the Liberal Democrats. There is hope for a different future, a different way of doing things in Britain, if we are brave enough to make a fresh start. So let today be the first day of the future of British politics. It may be only the beginning. But it is the beginning. The beginning of real change in Britain.